Find out the best way to make marijuana cuttings for cloning. Normally the last thing you would want to do is chop up your plant, but when you are taking cuttings for cloning, the method you use can have a real impact on the quality and success of the final plant. 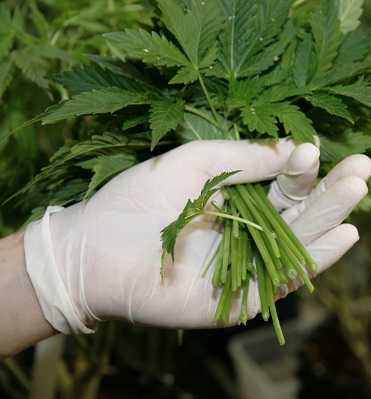 Marijuana cuttings are used for cloning marijuana plants, also see the section on marijuana cloning for more information on this process. Use cuttings to increase your stock of plants. A cutting, or ‘clone’ will have the same characteristics and genetic age as the plant it came from. If you grow a cutting for a while in constant light you can take more cuttings from it. You can take cuttings from any part of the plant but some bits root better than others. Growing tips with firm stems are ideal. Use a sterile razor blade to take 10 to 15 cm long cuttings. Make the cut on the stem between leaf joints. Cut the stem at a 45 degree angle. Immediately place the cut stem in p.h. balanced water. This prevents an air bubble forming in the stem which might block fluid uptake. Remove all but the top set of leaves. Dip cuttings in hormone rooting gel or powder then insert into your chosen medium. Make sure you don’t kink the stem as it gets pushed in. To ensure a perfect fit you can use a pencil or skewer to make a hole in the medium. Oxygen is important to help cuttings root, choose a loose growing medium that lets in plenty of air. Spray clones daily with shaken p.h. balanced water. Hydro clones should have their water changed daily if not being moved or aerated. Put fresh cuttings in a covered germination box or propagator and place them in moderate light such as a north facing window or under a fluorescent light. Coloured plastic bags placed over propagators make good shades from strong light. You don’t need to feed cuttings in compost at all until they root. Hydro clones will also root happily without added nutrients. After about 2 or 3 weeks start giving a weak nutrient solution (1/4 normal strength max). Cuttings should root in 14 to 28 days. Once the roots start to show, or the clones begin to grow, start removing any covering for short, gradually increasing periods, until the cuttings can endure outside life without wilting.